After completing a BA in Filmmaking, Sian went on to do a Masters in Screenwriting at Goldsmiths University in 2012. Her screenplay for ‘Masks’ was a Semi-Finalist for the Best Screenplay Award in the New Renaissance Film Festival in 2017. Her radio play ‘Telephone’ won the Roundhouse Radio Competition in 2014 and was subsequently broadcast. In 2017, her recent short film, ‘Shake It Off’, was nominated for Best Female Filmmaker and Best Social Realism Film in the New Renaissance Film Festival. 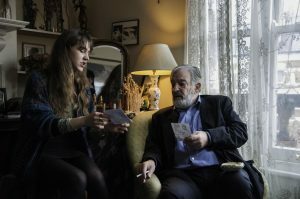 It was also an Official Selection in the London Independent Film Festival and Women on Screen. Kikki is the co-founder of the production company, After Everything Entertainment Ltd. which specialises in commercials, short and feature films. In 2014 Kikki moved from Germany to London to start studying at the University of Westminster. She graduated with a Bachelor of Arts from the ‘Film and Television Production’ course. She has gained professional experience in various fields of production working as a production manager, assistant and co-ordinator. Additionally, Kikki produced several short, fashion content films, commercials and music videos herself. Welcome to NRFF. We loved your short film ‘Shake it Off’, which was part our festival in London last year. How was your experience? Thank you so much! It was lovely to be part of such a friendly and welcoming festival. It was wonderful to see such a wide variety of films at the festival, and the award ceremony was an inspiring experience. I really felt a part of something exciting. (Sian) What is the story behind your debut feature, Masks? ‘Masks’ is about a group of people who all live in the same building in London. Throughout the course of a day, they find that their façades crack, as they navigate through a series of intimate, interlinking encounters. They couldn’t be more different from one another, but their journeys are all closely connected. (Sian) What was the inspiration for the film? I wrote a short script years ago about two people spending the night together in a bedsit, focusing on the intricacies of their experience of this one night, the intimacy to isolation of the encounter. I kept trying to rewrite it, but to no effect! As I was reading through my notes one day, I found all these different versions, all these stories based around the same idea, but with different characters and different events. They were all trying and failing to connect with one another, confined within the four walls of a room. That’s how ‘Masks’ became a multi-plot story: I housed all these stories under the same roof, with the different stories unfolding in different rooms. I liked the idea of people being so near to each other, yet so far away. We all hide so much in private spaces, behind thin divides. There’s such a profound division between the public and the private self, and I wanted to enter that space: the space where people reveal themselves to themselves. (Sian) Why should a story like Masks be told? We believe that Masks will be of interest to a wide range of audiences, as it explores topics pertinent to every life. A sneak peek can be found by watching the teaser included in our crowd-funding campaign. (Sian) Is there a central message that you would like to communicate? Each of the characters is so different, each of them wearing on their sleeve the complex bundle of influences and identities that make a person: their age, sexuality, gender identity, past experiences, traumas and behavioural propensities. However, at their core, they all want love, and they all have the capacity to be deeply hurt. They all want to hide the vulnerable side to themselves, however vulnerability can be cruel and abusive, as well as kind. The central theme of ‘Masks’ is the clash between the private and the public self, and the damage such everyday dissimulation causes. (Kikki) How did you get involved in the project? Sian was searching for a producer and we just clicked. I always liked films that depict life itself, and that’s why I fell in love with ‘Masks’. The characters are so brilliantly and uniquely developed, as are the themes of the film. When I read the script, I instantly knew that I wanted ‘Masks’ to be the first feature script I produce. (Sian) How would you describe your style of filmmaking? I’m interested in capturing something about everyday life, in what you could describe as a naturalistic style, but I’m also interested in exploring the uncanny aspects of reality. I find small, supposedly insignificant things to be full of beauty and meaning. The characters are very much at the centre of the story, so I believe that everything else should revolve around them. ‘Masks’ is certainly a performance-driven project, so I’m excited to start casting. (Both) How have you prepared yourself for making this feature? Kikki: I think we have both been prepared for this feature by the experience gained from past projects; however, we are also always looking to improve our knowledge-basis by closely following contemporary independent film culture in the UK and overseas. Sian: I’ve been working on the script for ‘Masks’ for a few years, so I know the characters and the world inside out. Throughout the writing process I’ve collected many thoughts and ideas about all aspects of the project. The teaser we shot for our crowd-funding campaign was also a great way to develop these ideas. (Both) What has been the most challenging aspect of the process so far? Sian: It took me a long time to find the right producer to work with, and I was very lucky to meet Kikki. We’ve already come a long way since we started working together. Kikki: in my opinion, the most challenging aspect of the process so far has definitely been the financing. We treat ‘Masks’ as a pure indie project, but we are still realistic about how much money we need in order to complete the production, as well as the post-production. (Kikki) How do you plan to raise the finance? We are planning to raise the finance with a crowd-funding campaign (please find the link for it here: https://www.indiegogo.com/projects/masks-feature-film-supported-by-charities-lgbt-drama#/). We are fortunate enough to be supported by great organisations in line with the film’s LGBTQ and feminist themes. We chose a crowd-funding campaign for the financing because we are also aiming to draw as many people as possible into the project from an early point, and to make them an integral part of the journey. (Kikki) When do you begin shooting? We are aiming to start production this year. (Kikki) Where can our audience find out more about the film? You can find us on Facebook: @MasksFeature, Instagram: masks_the_film and Twitter: @FilmMasks. 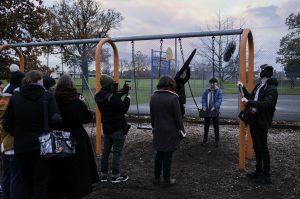 We also have a website which is constantly updated: www.masksthefilm.co.uk. To never miss an update you can subscribe to our website via the ‘news’ page.